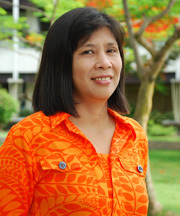 Ms. Wanida Khuntong serves as Secretary I at AIT Extension for 6 years. Her main responsibilities are Financial Monitoring, telephone and fax communication, filing, distribute mail, typing material, arrange transportation. She holds Diploma from Mahanakorn Commercial College School, Bangkok, Thailand.